In our last post for Tricksey Tuesday we tells it how to get away from a person. But maybe it doesn't work, precious? We are clever but maybe the person is persistent. Maybe it doesn't have friends or squirrelses or anyone to help it out. So we came up with another idea! When we took the hobbitses to her, we walks through a dark, dark cave. 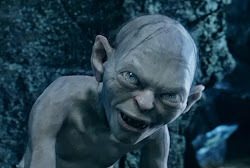 Smeagol is used to caves and darkness. We can see in it. But little hobbitses cannot. So we goes ahead and loses them! Maybe it is with a person it would like to leave? It can go somewhere dark. Very dark. A cinema? Or movie theater? They are very dark for movies. Maybe it can go see us! We likes our movies very much. So it goes inside and the movies starts, yes precious? Then it says it has to go do something important, even to get nasty chips. Smeagol doesn't like chips but we makes sacrifices to reach our goals. So it goes out, then away it goes! The person can't see it in the dark and it can leave them! Hehehehehe! So it should go see The Hobbit: The Desolation of Smaug, yes? On December 13. We are credited in it and our friend Andy Serkis is the "second unit director." It is very important, even if Smeagol dosen't know what it means. Go see it!! And get rid of nasty hobbitses! If we leave the movie, how will I see how awesome The Desolation of Smaug is then. Other than that, great plan, I will have it. The short blogger finally posts the comments! James - Smeagol does not understand. Is it only going to see it once? Does it not want to see the film many times? It may see us? Or give Andy Serkis lots of money? We suppose it could find another film to leave.